The earliest record of the Hewitt's living in Mattishall is the baptism in September 1870 of Juliet Ada Hewitt at St Peter's Church Mattishall Burgh. Juliet would later marry George Henry Seaman and the were the Post Master of the village for many years. Elizabeth Chapman Hewitt baptised Privately on Oct 21st 1807 at St Mary’s Banham – was Chapman the father? William Lovack Land a Widower of Blo'Norton Norfolk married Rebekah Hewitt a Spinster of this parish. Thomas married on July 16th 1809 at St Mary's Church Gissing - by licence. Thomas Hewitt a Bachelor of Banham married Sophia Mickleburgh a Spinster of this parish. In 1851 they were living at Hardwick Green Banham where Thomas was a Farmer of 50 Acres Employing 1 man and 1 boy. At that time Thomas and Sophia had 4 children, Charles, Emily, Caroline and Elizabeth. They had lost a son (John) as an infant in 1811 he was buried on Sep 6th at Banham Churchyard. From all accounts Sarah died - is this her? James and Susanna had children: - however no parish records are available - the 1851 census confirms the first recorded child was 'Daniel' with a birth date of about 1820. James and Susanna already been married ten years before Daniel was born so it can be assumed there would have been children to add to this family. Using the 1851 census on Hewitt's born a Banham gives a result of othe males that could be sons of James and Susanna. There would possibly also have been female children but they are harder to trace - If we had parish records of Banham it would be possible to trace females through marriage records. William married Anne unknown - in 1851 William was a Master Butcher living at Market Hill Attleborough, Norfolk. Then by 1871 A Cattle Salesman living at London Road Attleborough. The Daughter of John Cracknell a Wheelwright and Mary Ann Cole. Loftus married Elizabeth Gertrude Pearson on December 26th 1904 at St John the Baptist Church Stiffkey Norfolk - Entry 308. HEWITT.-13th inst., at Sierra Leone, West Coast of Africa, of intermittent fever, C. Sergeant-Major Gerald John Hewitt, of the 2nd West India Regiment, second son of Daniel and A. E. Hewitt, of Mattishall, Norfolk. He died of fever at Sierra Leone in 1885 just aged 27. Living next door is Juliet's sister Addie Hewitt (1875) who was assistant to Helen Harmer the village Post Mistress. Helen Harmer died in the Jun quarter of 1891. Is this how George Henry Seaman obtained the position which he has for the next several years? What is believed to be Helen Harmer standing left at the door of Talbot House Church Square. The picture is thought to have been taken about 1884. The postmen standing next to her could be he husband William Harmer and one of the ladies could be a Hewitt. Juliet is buried with her sister at St Peter's Churchyard Mattishall Bugh. No further information on George. Oscar Daniel Hewitt age 29 a Bachelor and Butcher married Elizabeth Lttleproud age 23, a Spinster. Not sure if Donald married? 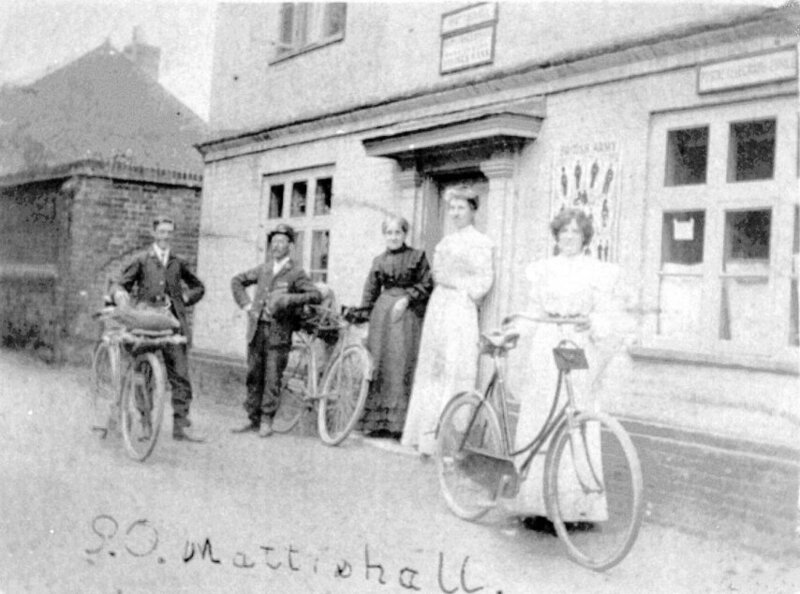 1900: James William Hewitt was recorded as Landlord to The Eight Bells puplic house on Dereham Road from 1896 - 1901. It is unclear if John and Olive had children. Loftus Hewett - Boarder - single - age 30 - Commerial Traveller - Norwich? Loftus Alfred Hewitt a Bachelor and Traveller of Wood Green London age 31 married Elizabeth Gertrude Pearson a Spinter of this parish. Daughter of Edward Pearson a Builder. Elizabeth Gertrude Pearson was born in the Jun quarter of 1874 at Walsingham Norfolk - The daughter of Edward Perason a Bricklayer and Publican born at Stiffkey and his wife Susannah Mann also a Publican born at Barney Norfolk. 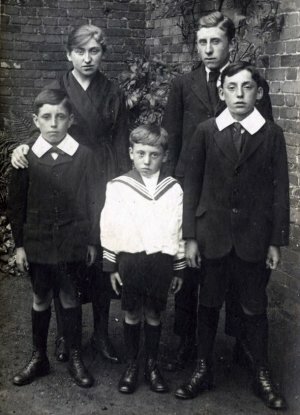 Edward and Susanna Pearson were Landlords of the Townshend Arms and Stiffkey from 1875 - 1923. The pub was closed in 1971. 1927: Apr 1 - The Edinburgh Gazette - Bankruptcy Receiving Orders. Loftus Alfred Hewitt, Wood End Farm. Harpenden, in the county of Hertford, farmer and managing director of Electricakes Limited.